Online shopping - some hate it, others love it. But I think we can all agree on one thing: Buying products online allows you to get pretty much everything from everywhere in the world delivered to your place. However that doesn’t necessarily mean that finding that one piece you are looking for is much easier than when you shop offline. Let’s imagine you are looking for a green maxi dress. Where on the world wide web should you start? You’ll surely be browsing some of your go to online shops first. But the more specific the piece of clothing your looking for, the less probably you will find it in the first few shops you’re looking at. Or maybe you’ll find your green maxi dress, but how can you be sure it’s the prettiest or least expensive around? 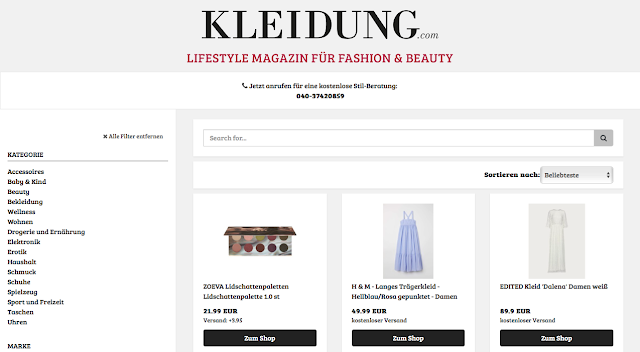 That’s where search engine shops such as Kleidung.com’s online shop come into play. They regroup the offers of various online shops to make sure you find exactly what you’re looking for, all while having the choice between several brands and prices. When you search for green maxi dress in the Kleidung.com shop you get various results from different websites. Now you can decide which one you like best and where to order it. Besides that, Kleidung.com also shares a lot of interesting articles, for example about what to wear as a wedding guest. So go have a look!